Physical Education and sport play an integral role in the life of the students at Christ’s School. Christ’s School has five teaching staff within the Physical Education department. The facilities include a full size sports hall with a comprehensive range of gymnastics and indoor sports equipment. The school also has 4 hard tennis/netball courts, a full size football and rugby pitch, a state of the art dance suite, a table tennis studio, as well as an outdoor summer athletics track (400m) and long jump pit. We also have an indoor traversing climbing wall and a 10m outdoor climbing wall. We have a close relationship with Richmond Cricket Club where we now have onsite access to a brand new cricket wicket, outfield and multi lane batting nets. Christ’s School places a huge emphasis on extra-curricular sport; in terms of recreational participation and competitive fixtures. We compete at a local, regional and national level in a range of sports. Just recently we won the U14 Dynamik National Schools Basketball Competition for the second year running. We have been awarded the Sport England Sportsmark Gold Award two years running due to the range of our extra-curricular clubs we offer students and our participation rates at these clubs. As well as offering our students the opportunity to participate in traditional sports such as Football, Rugby, Netball etc, we also offer students the opportunity to participate in Rowing, Trampolining, Table Tennis, Dance, Sports Leadership and Triathlon. Results within the department at GCSE PE and A Level PE are consistently outstanding. We consistently achieve ALPS 2/3 at both Key Stage 4 and 5 PE. The department is led by Mr Smith, the Head of PE, and a number of specialist PE teachers - Mr Sedour, Miss Wynn-Davies, Mr McCoach and Mr Morris. At Christ’s we firmly believe that Sport is a key component in building student self-esteem and self-confidence, as well as, contributing to the school ethos and driving further academic excellence. We believe drive to compete and excel in sport shapes a young person’s character, binds the school together and reinforces the drive to compete and excel academically. Christ’s PE department uses competitive sport to energise the school culture. Our school leaders understand sports value and continually promote it. Students enjoy competition at Christ’s, it pushes them to try harder and do better, obviously sport naturally carries with it the risk of failure or defeat, but we fervently believe how better to prepare students for the setbacks that life will inevitably throw at them. We know that not every child can or will go on to become a world champion, but we hope that every child will experience victories and defeats. At Christ’s we believe all students deserve the opportunity to have their sporting passion identified and nurtured. The Physical Education department at Christ’s School will provide the highest quality of teaching and learning in and outside of the classroom. We aim to provide a curriculum that stretches and challenges our most practically able students, as well as providing a platform for all students to flourish in Sport to exceed their potential. We will create extra-curricular provision in and outside of the classroom, which is inclusive, broad, competitive and enriching; one which allows all students at Christ’s to leave school with at least one sport they can participate in recreationally, socially or competitively in order to promote a healthy active lifestyle. We want to allow students to develop honesty, communication, social integration, leadership skills, display positive attitudes and learn qualities that are vital for success in sport, business and the wider world. We aim to reinforce in our students that knowledge and understanding of a sport will not only be achieved through practical participation, but through the roles of leadership, coaching, officiating and spectator analysis. We want students to acknowledge and to understand that immersion in sport is not just achieved through practical participation but through leadership, coaching, officiating and spectatorship. The PE department is committed to ensuring that every student has a positive experience in PE. We want to ‘inspire a generation’ and as a team we are looking to continually develop our knowledge and expertise so that our curriculum supports every child who comes to Christ's School. On entry to the school, we use data from our primary schools and our links through our school sports partnership to highlight able students. In the first half term and during the Spring Term the students are tested and re-tested on cardio-vascular endurance, muscular endurance, strength, speed, agility, power, coordination and balance. This gives the department a student athlete profile. The students’ scores are collated and are used as a baseline for the end of year target grades. Our aim by the end of Year 9 is that students will achieve their end of KS3 target. Many of our higher achieving students will opt for PE as one of their GCSE examinations. Currently PE is one of the most popular choices with over 35% of our Year 10 taking the course. Students participate in PE for two hours per week. Students take part in a number of activities to develop their skills, knowledge and understanding and tactical awareness in different sports. Students participate in a broad range of activities that change in a three-weekly cycle. Students are assessed after each activity using pre-defined assessment grids, which run in line with GCSE PE assessment criteria. Students are given aspirational, yet realistic target grades. Appropriate intervention is implemented for students who are underachieving in Key Stage 3 PE. During the winter and autumn term the curriculum sports include rugby, gymnastics, dance, health-related fitness, football, netball, gymnastics, trampolining, volleyball, basketball, badminton, trampolining, table tennis and cross country. During the summer term the curriculum sports include athletics, tennis, cricket, rounders, softball and stoolball. Students participate in PE for two hours per week. Students take part in a number of activities to develop their skills, knowledge and understanding and tactical awareness in different sports. During the autumn and winter terms the curriculum sports include rugby, gymnastics, dance, health related fitness, football, netball, gymnastics, trampolining, volleyball, basketball, badminton, table tennis and cross country. During the summer term the curriculum sports include athletics, tennis, cricket, rounders and softball. Students are assessed without levels after each block of work, using pre-defined assessment grids which run in line with GCSE PE assessment criteria. Criteria is assessed using a 5 tier system - Emerging, Rising, Secure, Advancing and Excellence. Students are given aspirational, yet realistic target grades. Appropriate intervention is implemented for students who are underachieving in Key Stage 3 PE. During the autumn and winter terms the curriculum sports include rugby, gymnastics, dance, health related fitness, football, netball, trampolining, volleyball, basketball, badminton, table tennis and cross country. Students are assessed using levels after each block of work, using pre-defined assessment grids which run in line with GCSE PE assessment criteria. Students in Key Stage 4 participate in two hours of PE per week. The activities in Year 10 and 11 prepare students to continue to lead a healthy and active lifestyle. Students study a range of activities, which build upon the skills learnt from Key Stage 3. During the winter and autumn term the curriculum sports include rugby, football, netball, gymnastics, trampolining, volleyball, basketball, badminton, trampolining, table tennis, cross country, orienteering and fitness. During the summer term the curriculum sports include athletics, tennis, cricket, rounders, softball and stoolball. Students also have the opportunity to participate in an alternative sports programme in which they may not be accustomed to. These can range from dodgeball, 3 sided football, futsal, handball, lacrosse, Danish long-ball, futvolei, foot golf, golf, trampolining, zumba, yoga and tchoukball. Students participate in PE for 1 hour per week at Year 10 and Year 11. Students take part in a number of activities to develop their skills, knowledge and understanding and tactical awareness in different sports. During the autumn and winter terms the curriculum sports include boxercise, handball, indoor football, rugby, dance, football, netball, trampolining, basketball, badminton and table tennis. Students also have the opportunity to participate in alternative sports which they may not be accustomed to. These can range from dodgeball, 3 sided football, futsal, handball, lacrosse and danish long-ball to futvolei, foot golf, golf, zumba, yoga and tchoukball. In Key Stage 4 students have the opportunity to study EdExcel GCSE PE. This course is 60% practical and 40% theory. Students are required to be assessed in four different practical activities, undertake a Personal Exercise Programme, analyse and observe a sporting performance and sit a 90-minute exam at the end of the course in May. In the practical element of the course students can be assessed in the role of performance of a sport, officiating and/or coaching. Our GCSE students also take part in an Outdoor Education residential trip to High Ashurst Outdoor Learning Centre to support the practical element of their course. Students have 3 lessons of GCSE PE per week. Students have one classroom based theory lesson and two practical lesson. The course follows a wide spectrum of activities ranging from anatomy, fitness testing, diet, training and the reasons for taking part in sport. Students are assessed at the end of each practical unit as well as with theory examinations every half term. We have high but realistic expectations for all of our GCSE students. We monitor them very closely and use department expertise to ensure they are being taught by specialists for as much of the course as possible. The practical program offers a wide choice of sports, which maximises the opportunity for students to achieve the best marks possible. In Key Stage 4 students have the opportunity to study EdExcel GCSE PE. This course is 40% practical and 60% theory. They are graded using the 1-9 system. Students are required to be assessed in three different practical activities and undertake a Personal Exercise Programme as part of the non-examined unit. In the practical element of the course our GCSE students also take part in an Outdoor Education residential trip to High Ashurst Outdoor Learning Centre to support the practical element of their course. Students have 5 lessons of GCSE PE per fortnight. During a typical week students have one classroom based theory lesson and two practical lessons. The course follows a wide spectrum of activities ranging from anatomy, physiology, fitness testing, diet, training and the reasons for taking part in sport. Students are assessed at the end of each practical unit as well as with theory examinations every half term and are graded using the 1-9 system. Students in Key Stage 5 have the opportunity to study OCR A Level PE. This course is 70% theoretical and 30% practical. The theoretical component is made of three modules; Exercise Physiology, Socio-Cultural Studies and Sports Psychology. Students are required to be assessed in one practical sport and for their coursework produce a verbal analysis of a performance. Students are also assessed in three theoretical examinations at the end of the course after two years. Students in Years 12 and 13 undertake enrichment on a Wednesday afternoon each week. This allows each student the opportunity to participate in two hours of Physical Education each week. The Sixth Form Sports Ambassador helps to organise and orchestrate the enrichment PE provision for all Sixth Form students on a Wednesday. 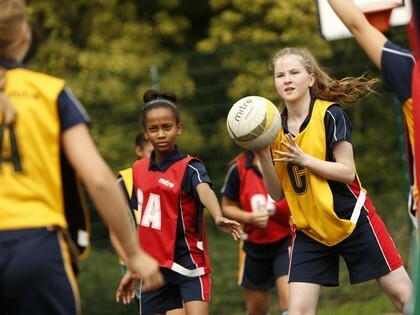 Competitive fixtures also occur in the sports of football, netball and basketball between Richmond Borough Schools. A full extra-curricular timetable is run to support the sports that we compete in for that term. Sports Clubs that we offer as part of our extra-curricular programme are extremely wide ranging and cater for both male and female participation. We also offer clubs for sports which the students wouldn't experience within the curriculum such as rowing, triathlon, trampolining, cheerleading and cross country. We regularly liaise with local sports clubs who are often supporting our extra-curricular programme by delivering extra sessions for us. We have established strong links with a variety of clubs and organisations including RFU, London Welsh, London Irish, TeamKeane Sculling School, Richmond Knights Basketball, Darius Knight Table Tennis, Brunswick and York Gardens Table Tennis, Kew Park and Sheene Lions FC, From the Dance Studio Floor, Belgrave Harriers and Kingsmeadow Athletics. There is an extensive inter school sports calendar which is co-ordinated by the Richmond Schools Partnership allowing Christ’s students to participate in fixtures and tournaments against other Richmond Borough Schools. These range from traditional activities such as football, netball and rugby to trampolining, badminton, table tennis, indoor rowing and volleyball. These occur across all secondary year groups. All Christ’s School sports fixtures, results, photos, video clips & match reports are now on Facebook and Instagram. Year 8&9 (U14) National Schools Basketball Champions!! Miss Ciara Wynn Davies is the School Games Organiser (SGO) at Christ's School. Her role is to increase participation, competition and progression for young people in sport through intra-school (internal school competitions eg Inter House sport), inter school (matches against other schools in a breadth of different sports), County festivals and National finals. This may take the form of competing in the above events but also officiating and volunteering as leaders to help run competitions. There is a strong House sport competition with two major events throughout the year; All KS3 & KS4 students take part in a Winter House Sport Day where they compete in Football, Rugby/Netball and Cross Country. During the Summer term all students compete in our Summer House Athletics Competition at St Mary’s University. To compliment these whole school competitions, all years experience different lunchtime house sports competitions also. We have strong links with our entire feeder primary schools that attend sports festivals hosted by the SGO every half term. We host the Borough Junior Basketball competitions, which are delivered by Richmond Knights. In addition, we have run a number of fun sports festivals for Reception and Year 3 pupils. Young Leaders from Year 8-10 are responsible for planning the festival and organising the equipment beforehand and then supervising and helping the children whilst they participated. The department has also hosted the junior football festival, which uses the sports leaders from Year 9. Advice is given on the many post-16 PE related courses on offer at various colleges, HE and FE establishments and in reference to work-based roles. Given the range and depth of quality in staff the PE department possesses we are in a strong position to advise students on career opportunities related to sport, as well as University and Sports College entry requirements. www.brianmac.co.uk - A sports coaching website which contains an expanse of material relating to methods and principles of training as well as goal setting, motivation and other psychological aspects. This is not aimed specifically at GCSE students so be aware that some of the material will be A-level standard. www.curriculum.qca.org.uk/ - Website providing resources, teaching guidance and ideas, information from National Curriculum teacher handbooks, and non-statutory guidelines, offered by the Qualifications and Curriculum Authority. www.bbc.co.uk/health - Features current news plus archives, guides by subject, "Ask a Doctor" inquiry feature, a searchable conditions database, message board, and much more. www.bbc.co.uk/science/humanbody - An interactive website which allows students to drag and drop muscles and bones into place. There is detailed information on muscles and bones and explanations as to their role and function. www.bbc.co.uk/gcsebitesize - A secondary school revision resource for students studying their GCSEs featuring written content, interactive content, audio, video and games. www.teachpe.com - A comprehensive Physical Education website covering all aspects of the course. Be sure to select ‘intermediate’ level as this website also contains a great deal of information for A-level study. This website is particularly useful for aspects of anatomy and physiology and the short and long term effects of exercise on the body. www.educationforum.co.uk - The Education Forum provides free learning resources for teachers and students. You are able to access, print and download extracts for your use. www.volunteering.org.uk - Volunteering England works to promote volunteering as a powerful force for change, both for those who volunteer and for the wider community. www.sportsinjuryclinic.net - A useful website detailing causes, symptoms and treatments for a wide variety of sporting injuries. It also has some useful diagrams of isolated muscles and their attachments. www.bhf.org.uk - Information about how to keep your heart healthy, 3d animation of a beating heart and information about various heart issues. http://info.cancerresearchuk.org/ - This new Cancer Research UK website is a one-stop-shop for all of your cancer information needs. It includes information on how you can live healthily, and much more. www.talktofrank.com - A to Z list of substances/performance enhancing drugs explains appearance and use, effects, chances of getting hooked, health risks and UK law. www.sportengland.org - Detailed website relating to sponsorship in sport, includes case studies and information about how to gain sponsorship and local and national provision.